Group Doueh's latest record is here and the plot continues to thicken! From the gorgeously cracked yet all-embracing opening drum roll of Zayna Jumma (the title track), it's evident this band is hell bent on redefining the sound of its influences and in turn, shape the future sound of its surroundings. It's musical alchemy in its purest, most remarkable form, pushing at the boundaries of geographical divergence while simultaneously speaking to the shared resonances between Western rock rhythms and the pulse of the Saharan trance tradition. Since its inception, Group Doueh's ability to craft pop hooks from a foundation of saharoui roots music has been a manifestation of sheer song craft and innovation. 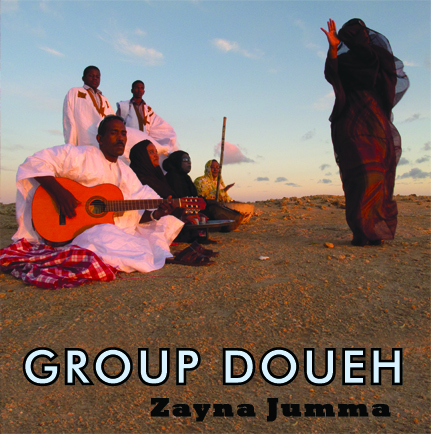 The tracks on Zayna Jumma are a deeper excavation of the group's forged terrain: a collision of contemporary Afro-Saharan grooves balanced with the searing modalities of Doueh's desert origins, finally nuanced by the transcendental pop/rock/desert blues elements honed from gestating in the fringes of the Sahara desert. For the latest installment of this Dakhla family's musical dynasty, Doueh recruits his next eldest sons El Waar (synth) and Hamdan (drum kit) , and wife Halima is augmented by three female backup singers. The band keeps evolving and this album reveals its newest phase - that of a formidable ROCK unit. The songs on this record were recorded in 2010, a busy year for Doueh, maintaining its day job as the go-to group of the Saharan wedding industry while still managing recording sessions and a tour with Tony Allen (Fela Kuti's long time drummer). On the heels of this momentum, Zanya Jumma is released to coincide with the group's 2011 spring/summer tour of the UK, Europe and a first ever US tour. This band continues to redefine the musical landscape and keep listeners amazed and transfixed. It's the perfect ecstatic music for the impending apocalypse, a rogue sound rooted in the past and yet boldly harnessing the aural possibilities of the landscape ahead... go ahead and jump aboard. Recorded on location in Dakhla, West Sahara in 2010 by Hisham Mayet.